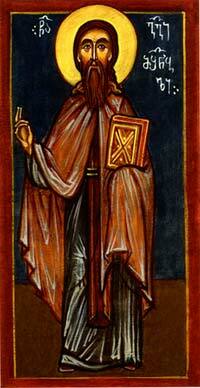 The venerable George the Builder was the third abbot of the Iveron Monastery on Mt. Athos. According to some sources, he was a nephew of St. John, the founder and first abbot of the Iveron Monastery. For most of his life Abbot George was highly respected and even revered in the imperial court of Byzantium, but he was eventually slandered, accused of treason, and exiled to the island of Monovatia, where he reposed in the year 1029. The Georgian monks translated St. George’s incorrupt relics from the island of Monovatia to Athos and buried them there in a marble tomb.